The first time I played Settlers of Catan was probably 2006. I didn't really know much about board games, aside from old classics like Monopoly, so when a friend brought it out at a party I was intrigued. To my surprise, I liked it. And, it turns out, many others did as well -- as of 2015, more than 22 million copies of the game (created in 1995) have sold worldwide. I too bought a copy for myself, and when the app version came out, I played it non-stop. It got to a point where, frankly, I played it so much that I got sick of it, and ended up deleting the app and giving the game away. But at the Game Developers Conference in San Francisco this week, I was ready to reacquaint myself with an old friend. 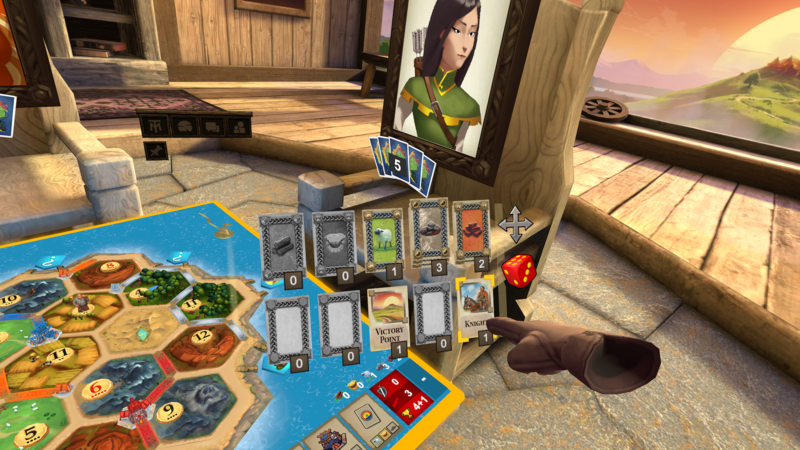 That's because the makers of Catan have partnered with publisher Asmodee Digital and developer Experiment 7 to create, you guessed it, a VR version of the popular board game, and release it at the show. It was even set up in a special area in the Oculus booth, complete with a giant mural of the Catan board on a wall and a fake board game table set in the middle. To be honest, I was skeptical that Catan in VR could capture the feeling of playing a real board game, but I was willing to give it a shot. The Catan demo in the Oculus booth was set around the aforementioned fake board game table, with an Oculus headset set up in each of the four sides. One of the upsides of Catan VR is that it's compatible with all Oculus systems -- it's playable on Samsung's Gear VR, the Rift and the upcoming Go. You can play the same game across the different headsets. I was set up to play the game with two other journalists as well as an Oculus spokesperson, with me on one of the Go headsets. Once I strapped it on my head, I was transported to what appeared to be a large room, with the iconic Catan sunset appearing in the distance. In the middle of that room was the four of us, sitting around a virtual table, with a virtual Catan board laid out in front of us. Yes, we were all playing Catan, while also apparently being on the island of Catan. How meta. If you don't like the setting, there's also an option to swap out to a Japanese-inspired environment complete with shoji screens. You can even change the artwork on the walls if you like. The board, by the way, looks great. I love the tiny little details like the trees in the forest, the sheep in the meadows and even a mine cart in the ore-filled mountains. Each of us were represented by different floating avatars. I was a viking helmet, while the other players were a cat, a wizard (represented by a wizard hat) and a masquerade mask. The players with the Rift had two hands (to represent their two controllers), while those with the Go only had one hand. The avatars and hands floated and moved around as the people gestured and talked. In a single-player environment, all of your opponents would instead be represented by AI personalities that you might recognize from previous Catan games (Candamir, Lin, Mary Anne and Nassir). An Asmodee Digital representative told me that Klaus Teuber, the inventor of Catan, actually provided substantial notes and input on how each AI personality should behave and play -- some might be more expansionist, while others might stay closer to one side of the island. The first thing you're tasked to do is to basically set up the board, whereby players take turns to decide where to place their first two settlements at the intersections of the game's hexagon tiles. If an intersection is available and represents a legal move, it will light up in white. More desirable locations -- usually an intersection with a higher probability of getting goods -- will be marked in green. So, as you might expect, the green locations are snapped up pretty quickly, and you have to be strategic enough to get a good spot while they're available. Once you decide where to put a settlement, a house will then be built before your eyes, as well as the accompanying road. 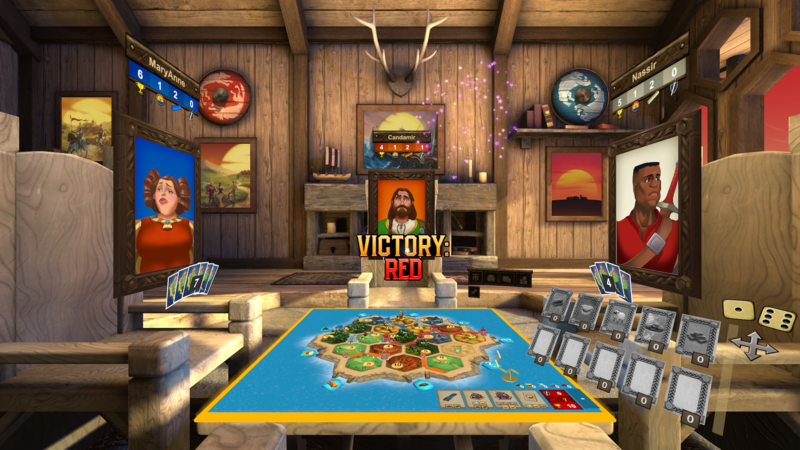 All of the player controls are housed in a little movable tableau area, which should be familiar to anyone who's played Catan before. On it, you can see how many resources you have, as well as icons for rolling dice, building houses or roads and, of course, trading, which is the heart and soul of any Catan game. When trading, you simply select which goods you're willing to trade, and then which goods you want in return. 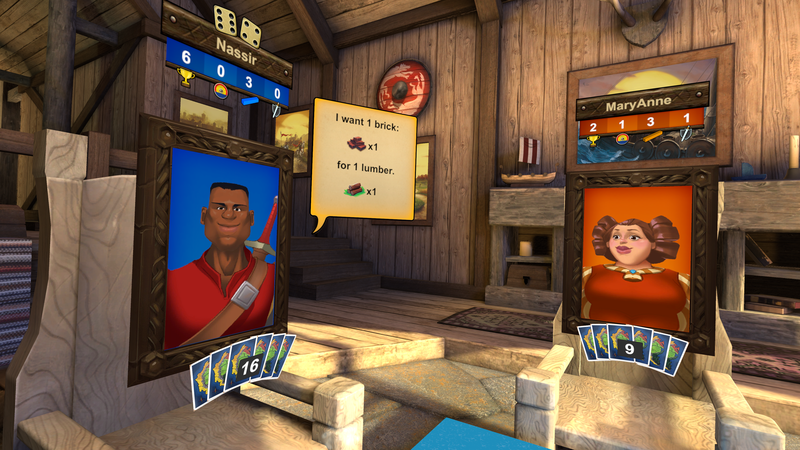 Your opponents can then make their own trading offers, which are represented by floating speech bubbles next to their avatars. To accept, hit the green check mark, or if you don't like any of them, hit the red x to cancel. From there, well, the game goes on, with people building roads and cities, dealing with the occasional robber, until somebody gets the requisite number of 10 points and is then declared the Lord of Catan. 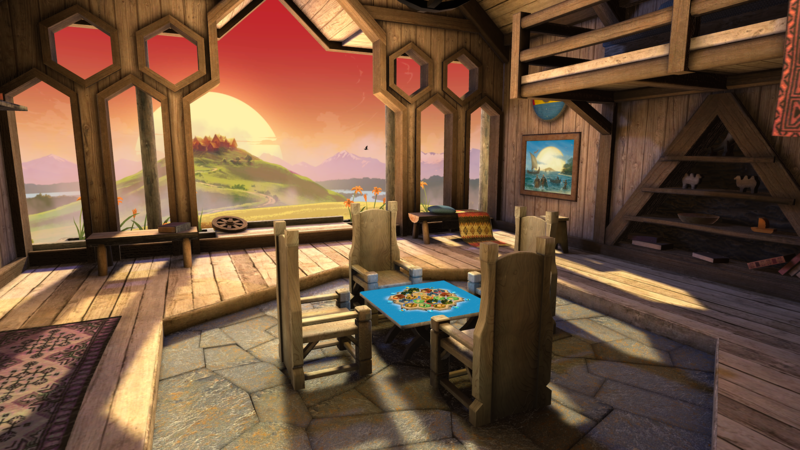 On the whole, playing Catan in VR feels a little bit like a hybrid of playing the game in real life and playing the app version. I do think the artwork is a little silly, and playing a board game in VR does sound a little weird, but in practice, it actually works surprisingly well. It's automated just like the app, but you get to experience the "feel" of playing with other people thanks to animated gestures and talking with the other players. A spokesperson tells me that you can choose to play with your friends of course, but you can also be matched up online with random strangers. I would personally feel a little weird about doing that, but to each their own. Amusingly, I was told by Asmodee that Teuber has actually used the VR game to play Catan with his two sons, who both live in different countries. And that social aspect is where I think a game like Catan VR really shines. One of the reasons I love board games so much, is that it's often a backdrop for social interaction, where people can come together, laugh, and joke around, while playing a game. A strict app-only experience, while still enjoyable, does away with the social part. But in VR, suddenly that social aspect is back. Now, like Teuber, I can play Catan with friends and family who live across the globe, and still capture that same feeling of camaraderie that I would have when playing the game in person. I look forward to the day when more and more board games can be played this way. 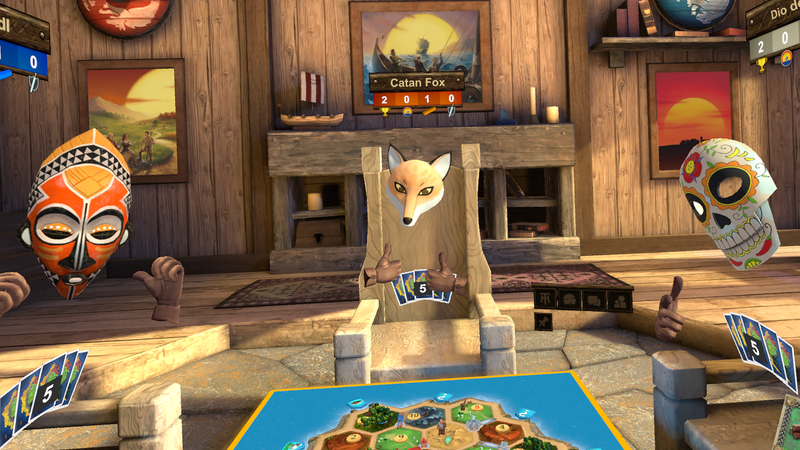 Catan VR is now on the Oculus Store for $14.99 and on the Gear VR store for $9.99. Once Oculus decides on a release date for the Go, we should get some clarity on when that version will be available.